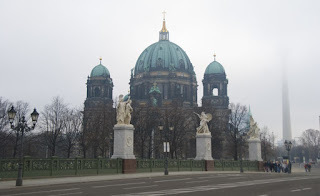 Berliner Dom, in the early morning fog with the base of the Television Tower lurking in the distance. 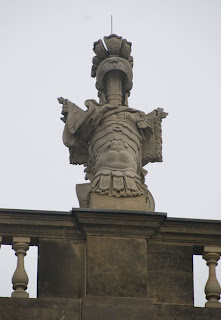 Vaguely disturbing faceless (and armless) figure on one of Humboldt University's buildings. Notice that while having no head or arms the figure has six pack abs! 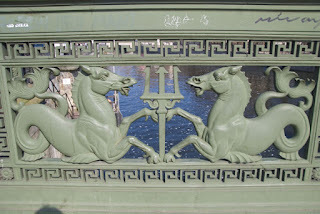 Pergamon Museum. 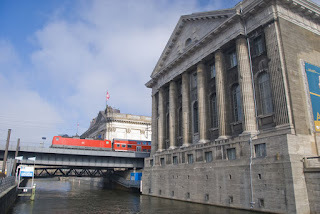 I love the juxtaposition of neo-classical architecture with modern red train. Today was one of those magical days where I had a rather specific plan as to what I was going to do and then managed to only do one of those things and everything that came after was just improvisation. I do this frequently. My philosophy is that sometimes you have to go the wrong way to get where you are really supposed to be. 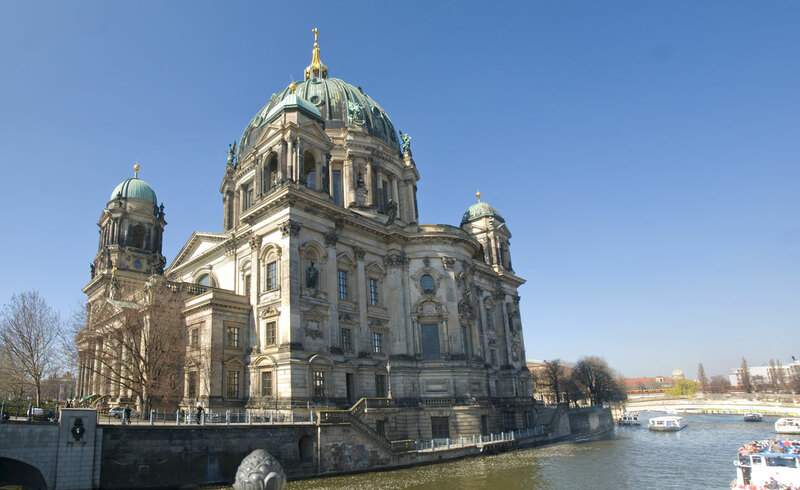 My plan was to see the Ishtar Gate in the Pergamon Museum and then go on a river cruise and then somehow get out to the Stasi museum in the far reaches of eastern Berlin for the only English tour offered that day. But that's not what happened because I meandered off course and, in doing so, had quite a lovely day despite my exhaustion and the sense of doomed history pervading all around me. 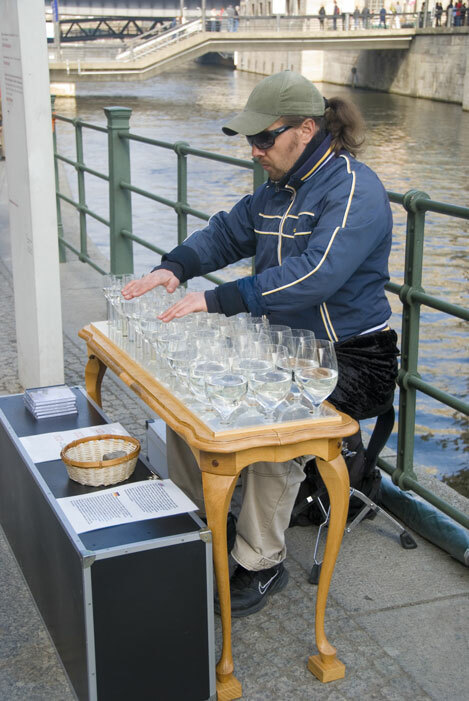 Man playing classical music on wine glasses outside the Pergamom Museum. He was quite a good musician. Then Traveler Eight disappeared. Well, not literally. Traveler Eight had a different path and time stream to follow this day. I got lost in Babylon. 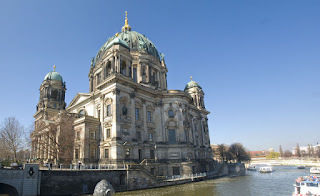 I was transported farther back in time where we worshipped Ishtar. I wandered the area around the Ishtar Gate and the processional way communing with lions, dragons, and sacred bulls. Akkadian art is amazing. I wish I had the skills of those ancient artisans, though perhaps I was one in a former life. 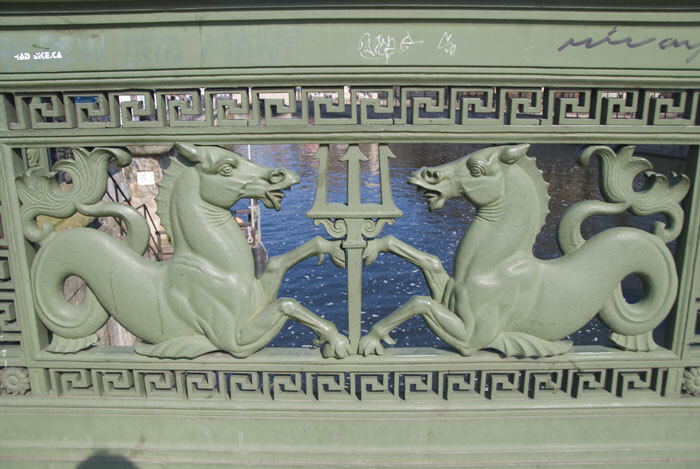 Detail on Bridge leading east off of Museum Island. But alas, real time intruded upon my trip to Sumeria. Twenty-first Century time was passing and there were other things to drawing me to them. Thus I extracted myself from the Pergamon Musuem to find that the fog had burned off and there wasn't a cloud in the sky and that I was surrounded by choir music. 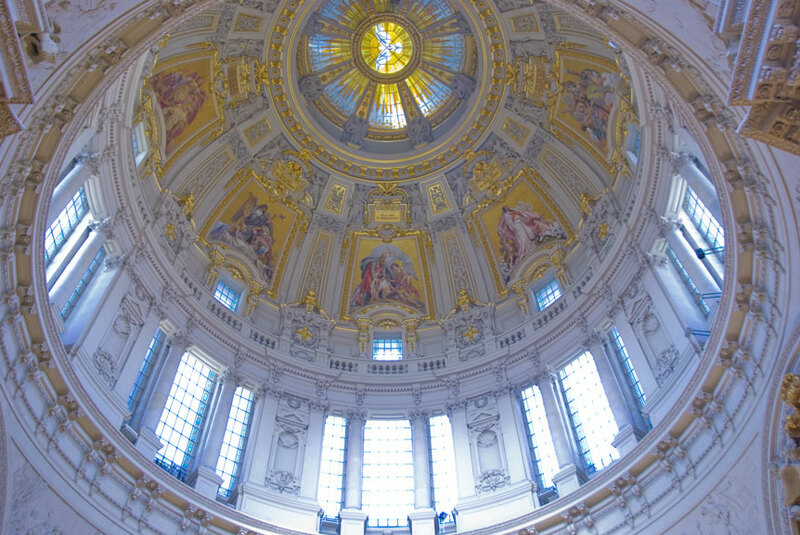 The music was coming from the Berliner Dom. I went there. There was a boys choir practicing after that morning's services. 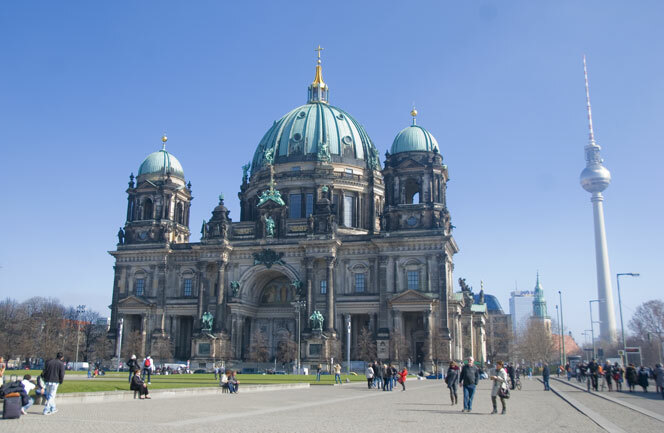 The Berlin Cathedral is beautiful but what I found myself most fascinated by were all the dead Prussian Electors and Brandenburg royals. And here is where literature and real life intersected for me in a lightning bolt of realization. 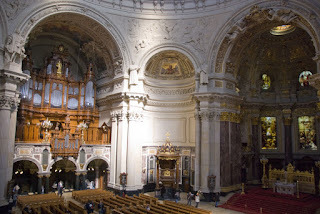 As I looked on the sarcophagus of Sophie Charlotte, the first Queen of Prussia, I realized she was the wonderful character in Neal Stephenson's The Baroque Cycle who carried on such splendid correspondence with the great mathematician/philosopher Gottfried Liebniz, one of the main characters of the books. And in real life they did indeed carry on quite a famous correspondence. 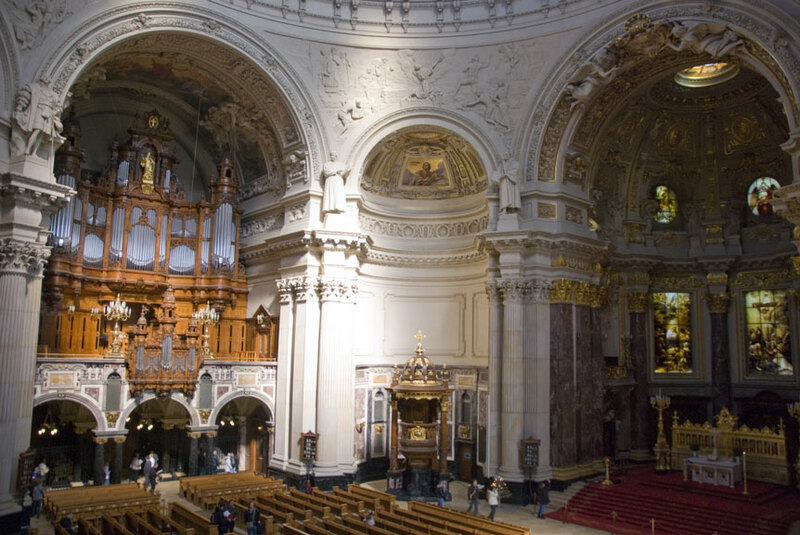 I left the church promising to learn more about the history of Prussia and the development of calculus. 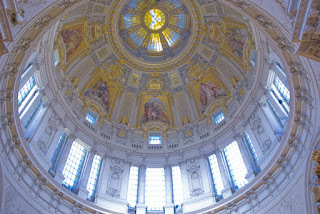 Berliner Dom. 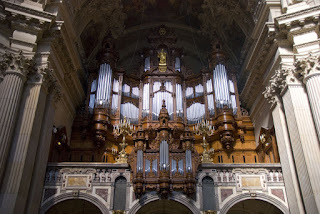 A most magnificent pipe organ. Playing with light in my camera. I have developed a recent obsession with capturing fire in my camera lens. At this point I have visited so many time periods my head hurt and, quite frankly, this nature loving tree hugger was fed up with all the crowds, lines, and fellow tourists. 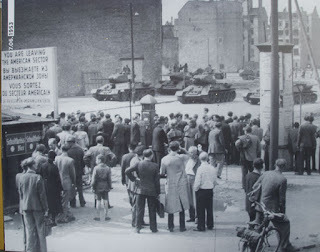 And I needed to get out of East Berlin. It's history is palpable. It was weighing me down. I needed a psychic break. 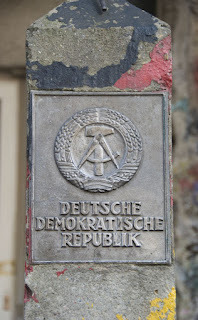 Thus the Stasi Museum would have to wait for me to, perhaps, return to Berlin. I headed to the nearest U-bahn station (subway). The Berlin subway is pretty easy to navigate, just remember to validate your ticket after you purchase it in the little machine next to the ticket machine (I'm sure this system makes sense to someone somewhere). Off I went to the western reaches of the Tierpark and Berlin Zoo. 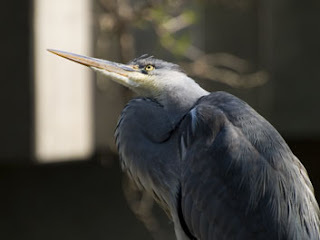 I wandered the parts of the Tierpark and then entered the Zoo (read about the Berlin Zoo in more depth in my next post). 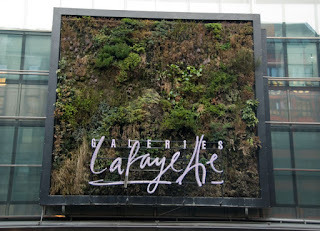 Here I wandered happily and then did something really rather brave. By this time it was mid-afternoon and I was starving so I ate a currywurst. Currywurst is a sausage (which kind differs from stand to stand) drowning in a curry-ketchup sauce usually served with fries. It is the epitome of Berlin street food. There is even a currywurst museum. And here is where I wish I'd been more awake and actually taken a photo of my meal. Why I didn't I don't know but I could kick myself. It was basically the world's most gigantic hotdog, at least a foot long and of significant girth, swimming in curried ketchup and piled with fries. It was incredibly impressive looking. I imagined that most men in the zoo cafeteria were feeling inadequate just looking at it. I can't say that I will ever want to eat another currywurst and I am glad I lived to tell the tale. 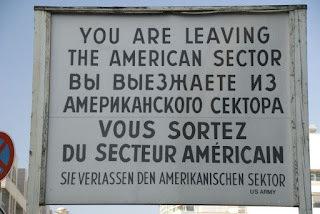 Copy of the original sign that stood at Checkpoint Charlie, the best known crossing point between East and West Berlin. Having restored myself somewhat by communing with animals and ingesting enough fat and cholesterol to kill an elephant, I once again headed to the U-Bahn. 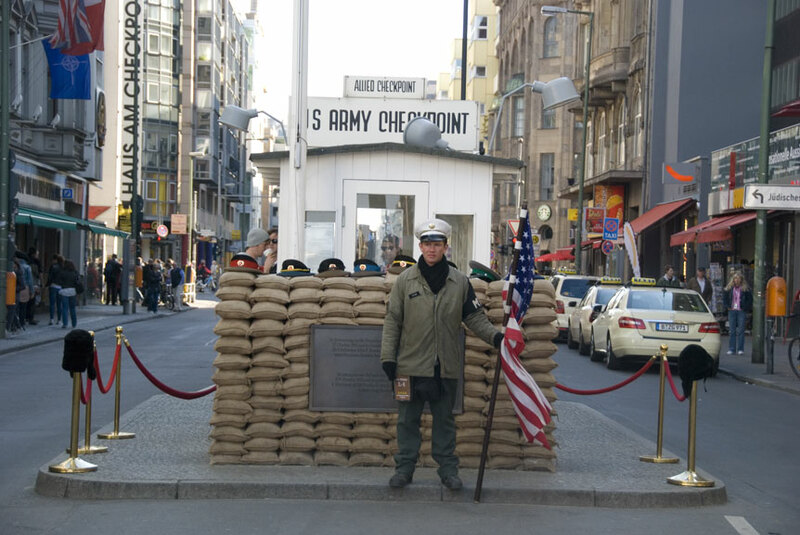 The station I needed to get out at was near Checkpoint Charlie and the Checkpoint Charlie Museum. Since my original intent, while visiting Berlin, had been to further my knowledge of WWII and the Cold War I decided that a stop at the Checkpoint Charlie Museum was a must (since I had skipped the Stasi Museum). 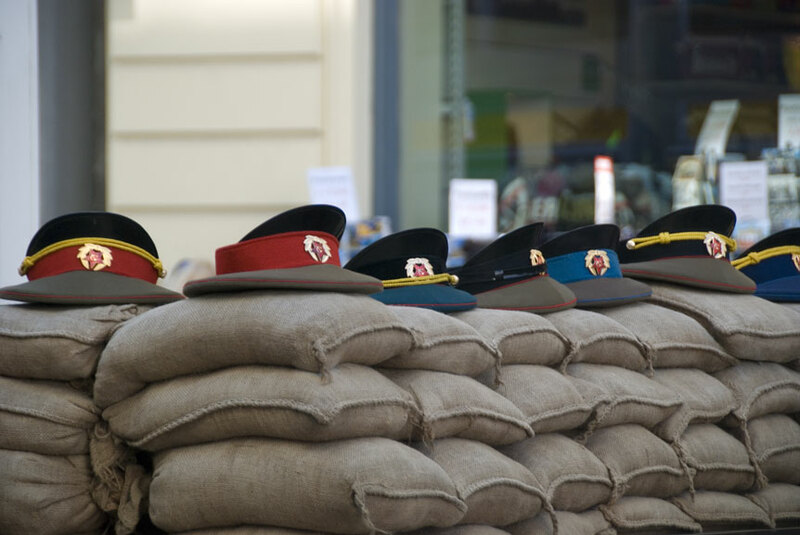 Go into the Checkpoint Charlie Museum prepared to read. A LOT. 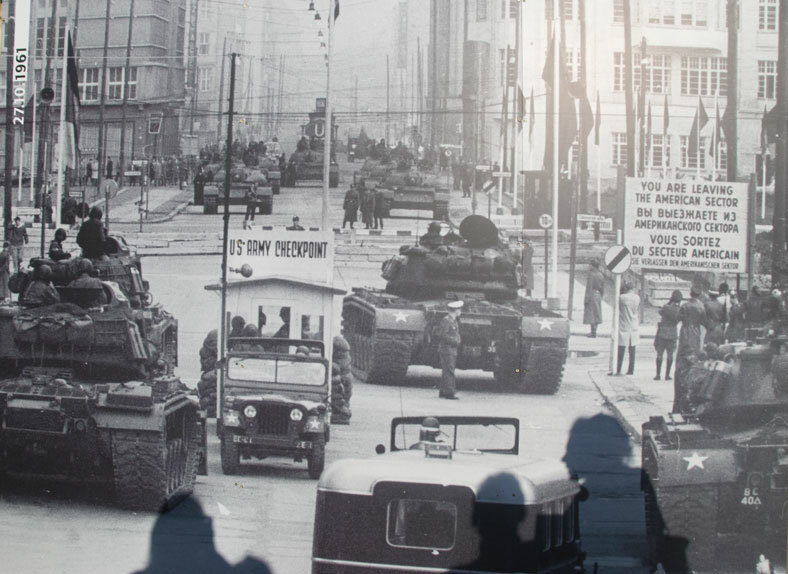 Most of the exhibitions are text heavy but there are lots of TVs set up with headphones where you can watch news footage from the Cold War era. I found myself horrified and amazed by the ways people escaped East Berlin. I was also very affected by leafing through the thousands of names of people who disappeared during the Soviet Era. 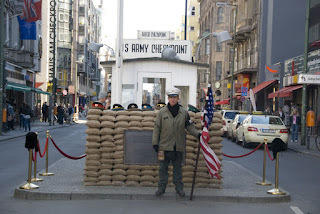 Then it was back on the street to pass through Checkpoint Charlie. Today it is really a tourist trap. You can pay to have your photo taken there wearing various hats of GDR (or DDR), Soviet, American, or French origin. 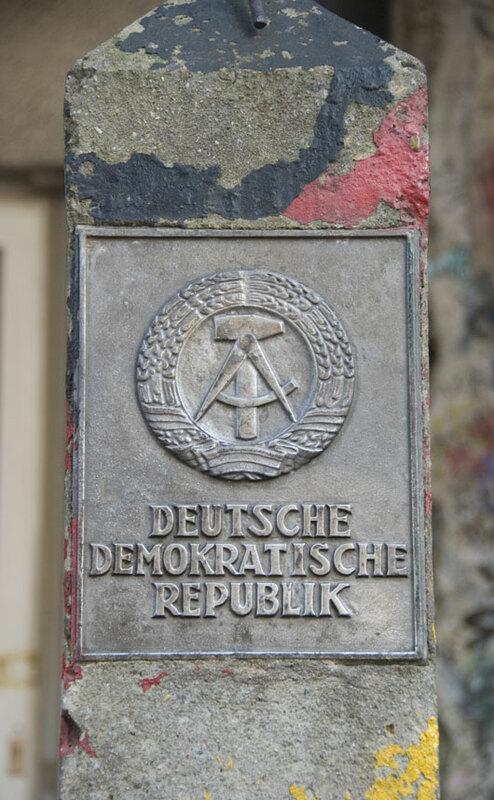 Or you can pay to have your passport stamped, again with stamps from the above regions, giving you "access" to East Berlin or West Berlin. That evening I got to watch Traveler Eight try to ingest a currywurst for dinner. I had a lovely gulyas that made my half Hungarian soul very happy. The next morning we left after eating granola pancakes again. 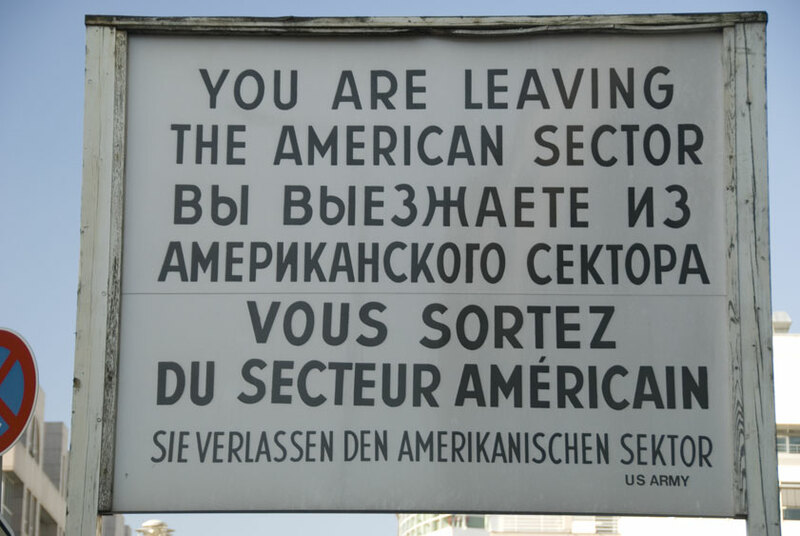 Goodbye Berlin. As we flew to Zurich for our connecting flight home I saw something I've never seen before. We passed just under the contrail created by another jet. I stared down the center of that roiling series of vortices, repeated over and over, like history folding in upon itself with the same atrocities committed again and again, just in another place. 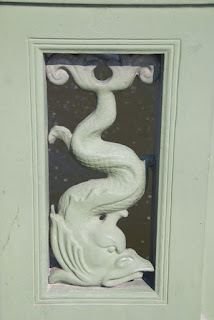 A living sign. 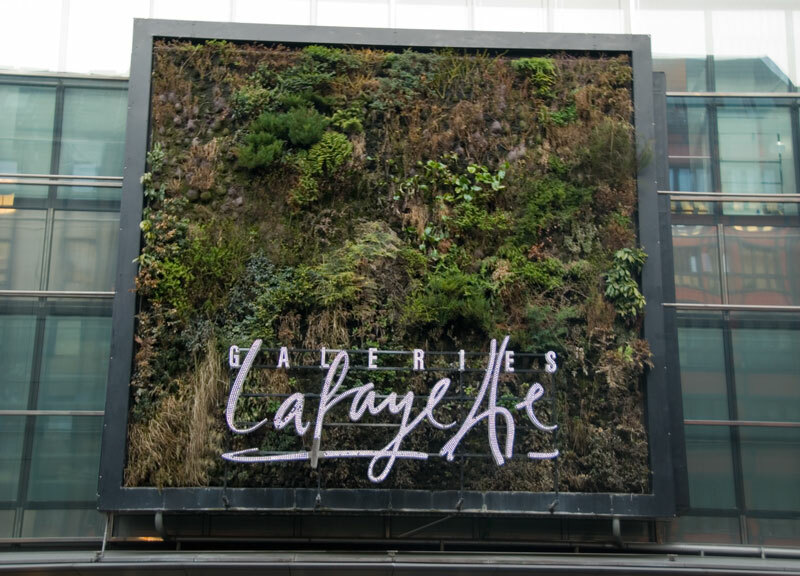 Yes, those are plants on that vertical sign for that shopping center. We flew AirBerlin to Zurich. I was happy to discover that they provide in flight entertainment of a most unique kind. 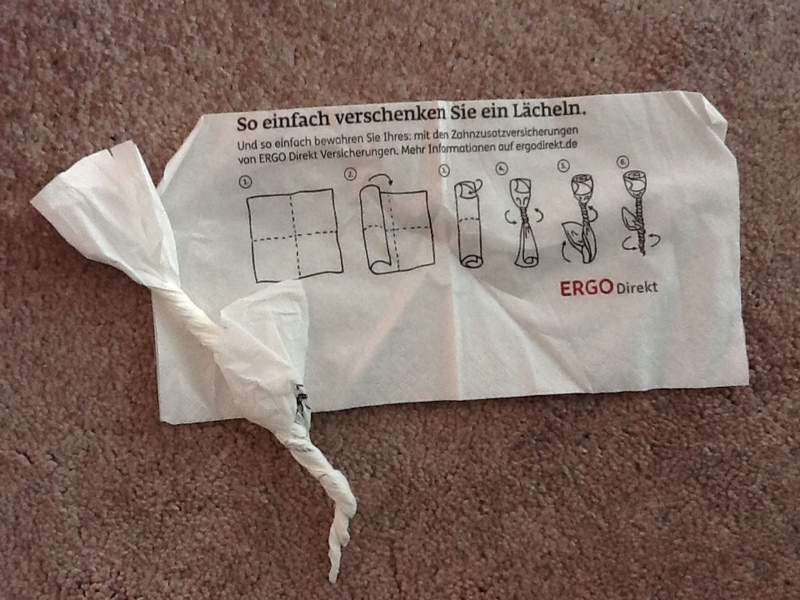 Their napkins give directions on how turn them into roses! So I did. That sounds like an amazing trip. 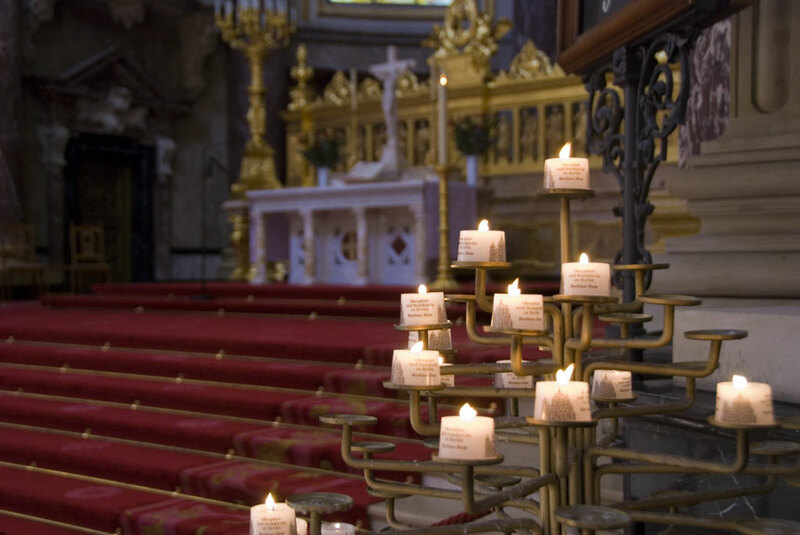 I have traveled around France, though many years ago. You make me want to go back.